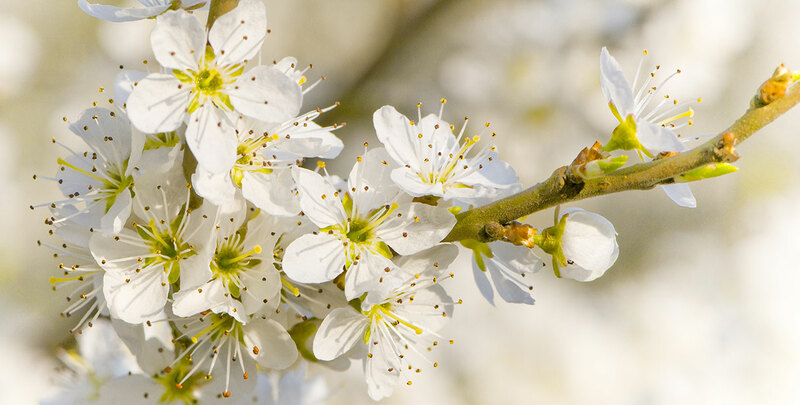 The blackthorn or sloe, also known by its botanical name prunus spinosa is a native, deciduous shrub, which has become a familiar sight all across the English countryside, as its long, prickly thorns have made it popular with farmers who want to create natural, stock-proof barriers. 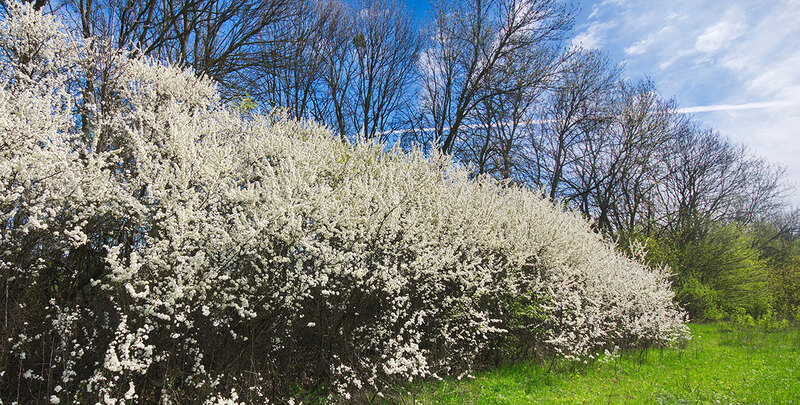 Blackthorns make dense, impenetrable hedges that carry pure white flowers on their bare branches in March, which are followed by bluish berries, known as sloes. The dark green, oval shaped leaves do not emerge until after flowering has come to an end and will turn orange before falling off. The blackthorn has become known as an excellent plant for hedging purposes and it is certainly the species to go for if you are looking to create a mixed native hedge. Blackthorn hedges will offer a home to nesting birds and small mammals and are therefore very wildlife-friendly. Insects such as moth and butterfly larvae eat the leaves and the flowers are highly attractive to bees. In rural areas, blackthorn hedges are often used to create cattle-proof hedges, but of course, its thorny branches are just as good at keeping other intruder, such as animals looking to attack a bird’s nest. Due to its relatively fast growth habit and extensive root system, it is not recommended to plant a blackthorn hedge in a small, urban garden. For those looking for a boundary hedge to be planted in a rural area, however, the blackthorn is a suitable alternative to the immensely popular hawthorn. Since the blackthorn is native to Europe, as well as western Asia, it will certainly thrive in our climate. It is also a very undemanding and low maintenance plant, which results in a very natural, almost wild look and therefore, the species is a good choice for wild and informal hedges. Its wood makes great firewood, as it burns very slowly with a good heat and develops very little smoke. In addition, the somewhat shiny wood is very hard and commonly used for the production of several tools, most notably for canes and walking sticks, which are generally fashioned from the straight stems of blackthorns. Additionally, clubs like the ones carried by the Royal Irish Regiment are made from this species. The most popular of blackthorn product, however, is its berries. The edible fruits, known as sloes, turn from purple to black during the autumn and can be picked after the first serious frost, as sloe berries become sweeter after the frost as reached them. Initially, the berries are a little tart, but the frost breaks down the bitter tannins and makes them suited for jam or, more commonly, for making sloe gin. 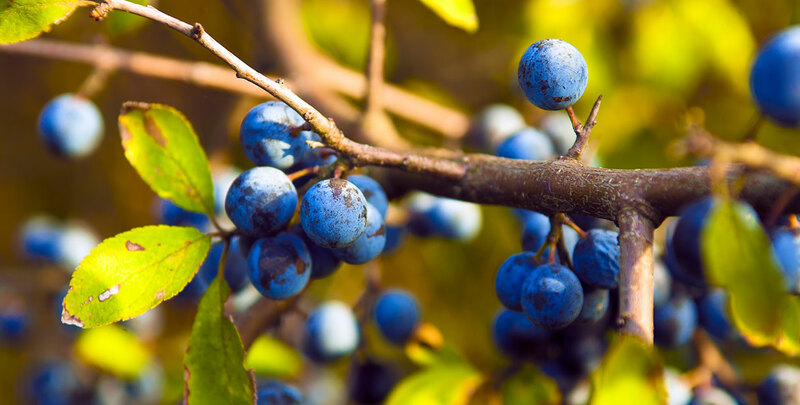 Alternatively, the sloes can be picked a little earlier to prevent the birds from eating them, as they appreciate these fruits as much as humans do. After you have picked the berries, your freezer can do the work that the natural frost usually does and after a little while, they will be sweet enough for consumption. A classic native hedging species, the blackthorn will tolerate a wide variety of soils, ranging from poor to fertile, from sand to clay, from dryish to waterlogged and from chalky to acidic. This robust hedging variety will do well in a sunny position, but it does not like full shade. Partial shade is acceptable, however. It is slightly more tolerant of the heaviest of soils than the equally versatile hawthorn, which is another highly appreciated boundary hedge plant in rural areas. 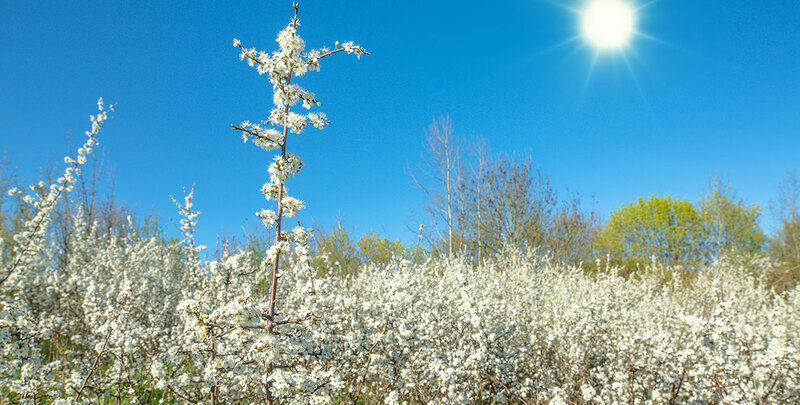 Because of its wild, rural look, its rapid growth rate as well as its strong resistance to wind, the blackthorn is also a plant favoured by city planners to plant on slopes and levees in order to give them a greener, more natural look. All of this makes a blackthorn hedge the perfect option if you are looking for a native hedge that you can grow with relatively little worries. Much like the hawthorn, the only soils it does not tolerate are actual bogs. Maintenance is fairly easy as well, as a blackthorn hedge only requires minimal pruning around the early summer. Unlike many other hedges, you do not have to invest a lot of time into keeping this hedge in shape, as its wild, natural look is part of its charm. While blackthorn hedges are not commonly appreciated for their ornamental value, the flowers that grow on its bare branches during springtime are beautiful and the remarkably dark bark that the blackthorn is partly named after makes this hedging plant a remarkable sight. A blackthorn hedge is not a traditional hedge in the sense that it is very unlikely to encounter a straight, neatly pruned blackthorn hedgerow in an urban garden. In fact, it does generally not make a very good garden hedge, unless you have a garden large enough for its extensive root system to develop. As a British countryside hedge, however, it has repeatedly proven its value. While it certainly will keep cattle at a safe distance due to its long, sharp thorns, it will also emphasize the rustic look of your farmstead, while its berries are an essential ingredient for many tasteful foods and beverages. As you can see, a blackthorn hedge is a truly multifaceted hedge, as its protective merits for humans and animals alike are complemented by its culinary use and the versatility of its wood.